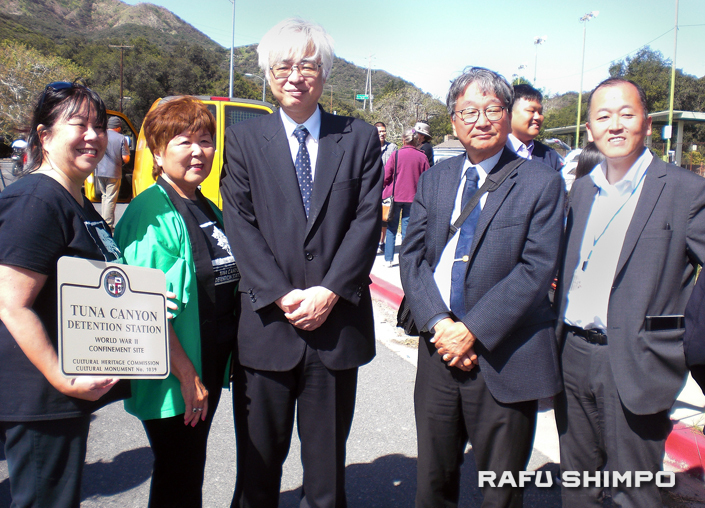 From left: Nancy Takayama and Nancy Oda, Tuna Canyon Detention Station Coalition; Deputy Consul General Hiroki Matsuo; Chris Komai, Little Tokyo Community Council; Consul Shigeru Kikuma. 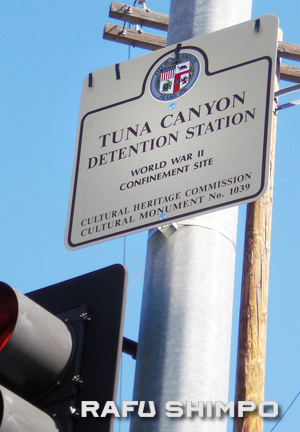 Los Angeles street signs officially marking the site of the Tuna Canyon Detention Station were unveiled April 12 by city officials and community leaders, including some with family members who were interned. Located in Tujunga, Tuna Canyon was originally a Civilian Conservation Corps camp. After the Pearl Harbor attack, the U.S. Department of Justice transformed it into a detention center that housed some 2,000 Japanese, Italian and German immigrants from 1941 to 1943. The detainees lived behind barbed wire, surrounded by armed guards, until they were transferred to other camps. A city sign designating Tuna Canyon as Cultural Monument No. 1039. The buildings were later razed to make way for the Verdugo Hills Golf Course, which is now closed. The Los Angeles City Council designated a grove of oak trees — which was present when the camp was in operation — as a historical-cultural monument. However, the property owner is trying to have the designation rescinded, and no memorial has been established at the site of the camp. The street signs, spearheaded by City Councilmembers Monica Rodriguez of District 7 and David Ryu of District 4, are on city property and are unaffected by the lack of public access to the site. They are located at the intersection of La Tuna Canyon Road, Tujunga Canyon Boulevard and Honolulu Avenue. Rodriguez noted that people of Japanese ancestry were uprooted not only in the U.S. but also in Canada, Mexico, Peru, Chile, Argentina and other countries. Those from Latin America were shipped to camps in the U.S., including Tuna Canyon. Ryu, the city’s first Korean American councilmember and only the second Asian American ever to serve on the council, said, “These are hallowed grounds. Today we honor this site with a sign which stands tall to remind us of human rights and dignity that were lost here. It was here where so many were wrongfully detained, taken from their homes, degraded and dehumanized. 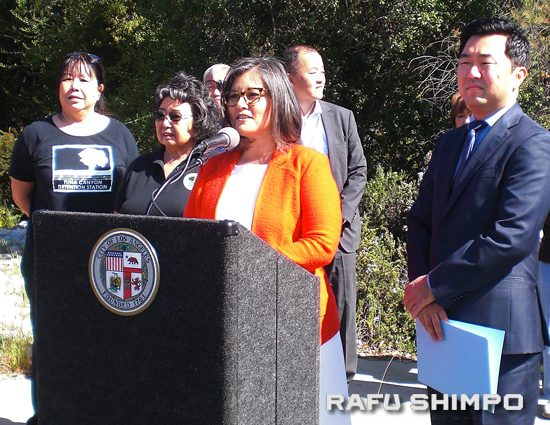 The City of Los Angeles was represented by Councilmembers Monica Rodriguez and David Ryu (right). “This is where everyday people were denied their American rights as human beings. This is where the politics of fear allowed our country to betray our neighbors, to betray our Constitution and to betray the fundamental values of freedom and equality. This is not ancient history … We gather here today to preserve and to remember because we will not let history repeat itself and we will not be silent, for silence is a friend of evil. Deputy Consul General Hiroki Matsuo praised recent efforts to commemorate wartime confinement sites. 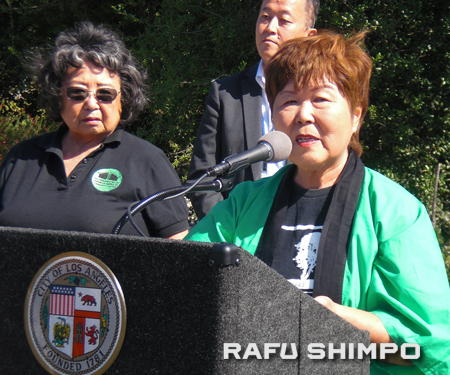 “Tuna Canyon serves as a reminder of all the negative consequences of war, something that has greatly inspired me in getting to know the regional Japanese American community, and I have been moved to hear of the difficult history and the community’s perseverance through the **gaman** spirit and contributions to American society. Tuna Canyon is one of those stories that has much to teach us. 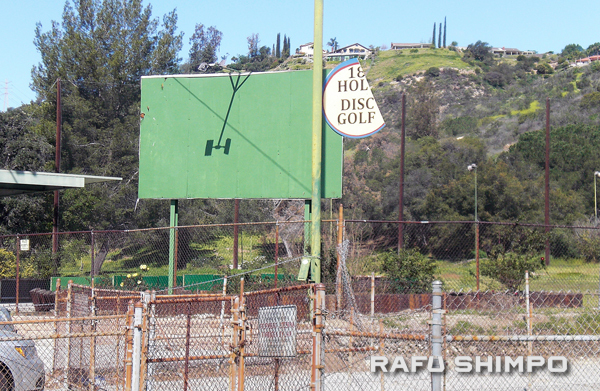 The Tuna Canyon Detention Station site later became the Verdugo Hills Golf Course, which is now closed. Nancy Oda, president of the Tuna Canyon Detention Station Coalition, speaks about the importance of commemorating the site. Komai noted that in addition to Tuna Canyon, Issei like his grandfather were held in several different camps, including Fort Sill (Oklahoma), Missoula (Montana), Livingston (Louisiana), Santa Fe (New Mexico) and Crystal City (Texas). In many cases they were separated from their families for the duration of the war. With camera crews recording the moment, the dignitaries pulled a cord to unveil one of the signs. Among those participating in the ceremony were James Okazaki, formerly with the city Department of Transportation and now a Tuna Canyon Detention Station Coalition board member; Elizabeth Doomey, board member of the San Fernando Valley Japanese American Community Center; Lloyd Hitt, local historian and chairman of TCDSC; Marlene Hitt, Sunland-Tujunga Neighborhood Council board member; Marianna Gatto, director of the Italian American Museum of Los Angeles; Hans Everhard of the Tricentennial Foundation; Bill Skiles of the Little Landers Historical Society; Consul Shigeru Kikuma; TCDSC board members Kanji Sahara, Kay Oda and Nancy Takayama; and Donna Sugimoto, whose grandfather was interned at Tuna Canyon (as was Takayama’s).